Background: Mechanics plays an important role in regulating cell migration, growth, development and apoptosis. Such mechanically induced apoptosis is termed mechanoptosis. Substrate rigidity and attachment is important for growth of normal cells, in the absence of which they undergo programmed cell death called anoikis. Transformed cancer cells are resistant to anoikis and therefore proliferation of cells in soft agar is used as a classical test to identify them. These transformed cancer cells cannot sense matrix rigidity and a previous preprint from the same group showed the importance of cytoskeletal components (especially TPM2.1) in cancer cell survival (Yang et al. 2018). However, many other reports point to how forces could impede cancer growth, even in mice (Berrueta et al. 2018, Lien et al. 2013, Regmi et al. 2017). In this preprint, the authors test the importance of forces in selective apoptosis of cancer cells and the mechanisms regulating these. Key findings of the preprint: Although cancer cells are resistant to anoikis, the authors find that they are extremely sensitive to mechanoptosis. Upon cyclic stretch, transformed cancer cells show reduced growth and become apoptotic. This can be rescued by addition of TPM2.1 protein that also helps in sensing matrix rigidity. On the other hand, cyclic stretching of normal cells results in increased cell growth even on soft agar, thereby rescuing these cells from anoikis. While anoikis of normal cells or cancer cells restored with TPM2.1 depend on death associated protein kinase 1, mechanoptosis involves a different molecular mechanism. 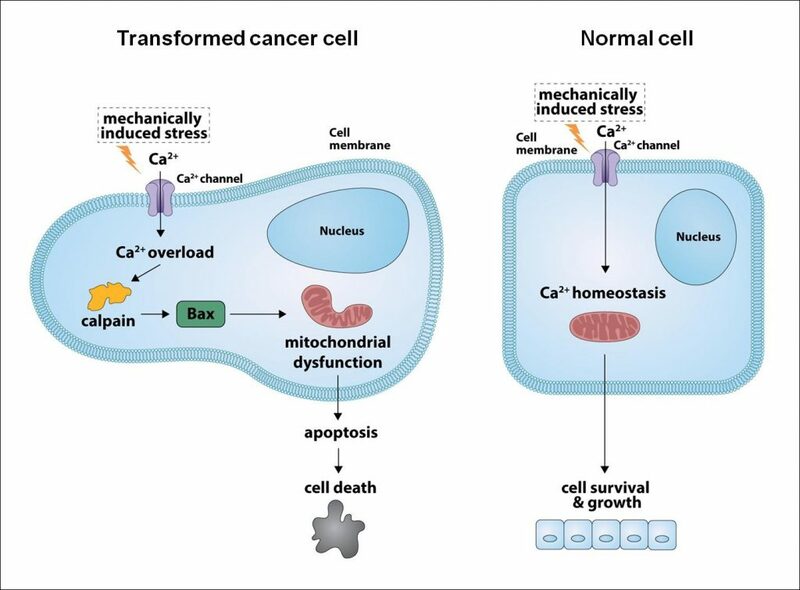 The authors find that mechanosensitive calcium channel Piezo1-mediated calcium influx and accumulation is important for mechanoptosis of cancer cells. In response to accumulated calcium, calcium dependent calpain 2 protein is activated, which triggers the downstream BAX-mediated mitochondrial apoptotic pathway. In normal cells, the calcium concentration is tightly maintained and it mediates cell proliferation possibly by a YAP-mediated mechanism (Aragona et al. 2013, Cui et al. 2015). Image adapted from Tijore et al., 2018 with permission from authors. What I liked about this preprint: This is a very interesting study that delineates substrate rigidity from strain experienced by a cell. Although TPM2.1 levels are essential for both of the responses, the downstream pathways are very different. The authors have used multiple cancer lines and can rescue these effects as well. Further, normal cells can be transformed and show similar phenotypes, which shows that this is not an indirect global effect. This work shows the importance of mechanics in regulating cellular phenotypes and dissects the specific molecular mechanisms giving rise to these cellular fates. Future directions and questions for the authors: It would be very interesting to test the importance of mechanics in tumor apoptosis in an in vivo context and see if these principles still apply. It would also be very interesting to test the role of mechanics in cancer organoid cultures. To authors: The paper starts with the difference in substrate rigidity in determining the response (here, aspect ratio or AR) of cancer cells and how this can be rescued by addition of TPM 2.1. 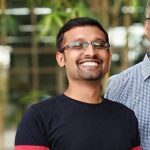 So how is AR connected to growth defect or apoptosis? How does TPM2.1 level regulate Piezo activity? Edoardo Salladini, Claire Debarnot, Vincent Delauzun, et al. Aruna Marchetto, Shunya Ohmura, Martin F. Orth, et al. Nicole M Sodir, Roderik M Kortlever, Valentin JA Barthet, et al. Katarina Valoskova, Julia Biebl, Marko Roblek, et al. John Fadul, Gloria M Slattum, Nadja M Redd, et al. Chiara Borga, Clay Foster, Sowmya Iyer, et al. Unjamming overcomes kinetic and proliferation arrest in terminally differentiated cells and promotes collective motility of carcinoma. Andrea Palamidessi, Chiara Malinverno, Emanuela FRITTOLI, et al. Alexander Swoboda, Robert Soukup, Katharina Kinslechner, et al. Amber N Stratman, Olivia M Farrelly, Constantinos M Mikelis, et al.